Not only is it a gorgeous plant, aloe vera is easy to grow indoors as a potted plant, and makes a wonder houseplant. Given the proper aloe vera plant care, these amazing plants can live for many, many years. Aloe vera (also known as medicinal aloe plant) is a very popular plant that is best known for the healing qualities of the gel. They are common succulent plants, and aloe vera is just one of hundreds of different types of aloe plants. Whether you want to grow aloe vera to harvest it’s medicinal gel, or you simply love the look of the plant, it’s definitely one that you will be able to enjoy for many years to come! My aloe vera is one of the oldest plants in my collection (it’s almost 20 years old now, maybe I should throw a party!). I bought it as a tiny plant that was barely large enough for the four inch pot it came in. Over the years it has grown to be huge, and has been propagated many, many times. How fast does aloe vera grow? 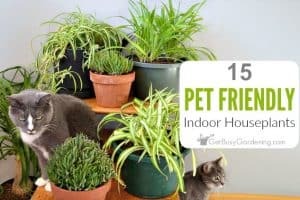 They can grow pretty fast outdoors, but are much slower growers when kept indoors as houseplants. If you want your potted aloe plant to grow faster, then put it outside during the summer (just make sure the pot has drainage holes!). Most people are already very familiar with the medicinal and healing benefits of aloe vera plants. These days you’ll find aloe vera gel in everything from skin and haircare products, to drinks, supplements, and food products. Heck, I’ve even heard it referred to as a superfood (the buzzword of the century, right!). You can harvest aloe vera gel from your plant to use it on minor burns and cuts, and even to make your own soaps, lotions, and other skin care products if you want. Another great benefit of growing aloe vera as a houseplant is that it helps to purify the air in our homes. Now we know why aloe vera is such a popular plant these days, and everyone wants to grow their own (me included)! The good news is that aloe vera plants are super easy to grow houseplants, and they grow very well in pots. There’s really not much to it, and guess what – your aloe vera might just do better if you ignore it, they thrive on neglect. But, there are a few things you need to do to keep your aloe vera growing it’s best. The two most important parts of aloe vera plant care are proper watering and lighting. The most common mistake people make when it comes to aloe vera plant care is overwatering. Consistent overwatering is the number one killer of aloe vera plants! In nature, aloes grow in desert climates where they hardly get any rain. Aloe vera succulent plants hold water in their leaves, so they can go a very long time without water. Overwatering will cause root rot, and eventually cause the stem of the plant to rot, eventually killing the whole plant from the bottom up. Oh boy, we definitely don’t want that to happen! Aloe vera plants like to be watered more during the summer than the winter months, but will not tolerate being consistently overwatered at any time during the year. It’s best to allow the soil to dry out completely between waterings. Stick your finger one inch into the soil to make sure it’s dry before watering aloe vera. When it’s time to water, give your aloe vera plant a good drink, allowing all of the excess water to run out the bottom if it’s planted in a pot. Never leave an aloe plant sitting in water though, and the soil should never be soggy. If you struggle with overwatering plants, I highly recommend using a soil moisture gauge to help you figure out when to water your aloe vera. Aloe vera plants go into a state of dormancy during the winter, and mature aloes won’t need much water at all during that time. I only give my large aloe vera plants a small amount of water 2 or 3 times during the entire winter, smaller plants will need to be watered a bit more often. The second most important thing about aloe vera plant care is proper lighting. Aloe vera plants will grow their best when given lots of light. If they don’t get enough light, they will grow tall and leggy over time. This can be especially challenging when growing aloe vera indoors. Outdoors, aloe vera can be grown anywhere from full sun to partial shade. A south facing window would be the ideal spot for an indoor aloe plant, but they also grow well under artificial lights. If you don’t have enough sunlight in your home, then you should definitely get a grow light for your aloe vera. If you’d like, you can move your potted aloe vera plant to a sunny spot outside during the summer months, but be very careful when you first move it outside. An aloe plant that has been growing inside all winter will be sensitive to direct sunlight. So make sure to slowly acclimate your plant to the sun or the leaves could burn (it’s kinda ironic that aloe vera plant leaves can get sunburned, don’t you think?). The best soil for aloe vera is one that drains very quickly, and doesn’t hold water. A commercial succulent soil potting mix for aloe vera and other succulents would work great. Or you could use a gritty succulent soil mix which will make it even easier to ensure you don’t overwater your aloe vera. I like to make my own succulent soil, using a mix of perlite or pumice, sand, and regular potting soil, which tends to be cheaper than buying the commercial stuff. 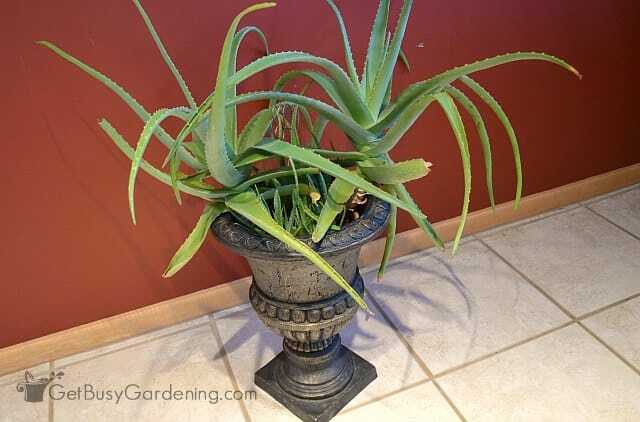 If you plan to repot your aloe vera, make sure you use a container that has drainage holes in the bottom. Pots made out of terracotta or clay are the best pots for aloe vera, and will help to keep you from overwatering your plant. The clay wicks water out of the soil helping it dry out much faster, which is ideal for growing aloe vera (and it looks pretty too!). To keep the soil from spilling out the drainage holes, but still allow the water to drain, cover the holes with drainage netting, or an extra piece of window screen or landscaping fabric. Aloe vera plants don’t really need to be fertilized. But like most plants, they will benefit from being fed once and a while during their active growing season (spring through summer). I recommend using organic plant fertilizer on your aloe vera, rather than the chemical stuff – especially if you plan to harvest and use the gel. A general purpose organic succulent plant fertilizer will work great for aloe vera plants. Compost fertilizer is also a great choice. You can use a pre-made compost tea, or you can buy compost tea bags and brew your own. Fish emulsion and liquid kelp are also fantastic natural liquid fertilizers for feeding aloes (but I recommend only using those on outdoor plants because they are stinky). Aloe plants go into a state of dormancy in the winter, and will hardly grow at all. So, don’t fertilize your aloe vera plant during the fall and winter months. Fertilizing your aloe vera plant a few times during the growing season can also help to encourage flowers. Even though they can bloom, it’s very rare to see an aloe vera flower on plants that are growing indoors. I’ve had my aloe vera plant for almost 20 years, and it has never flowered (I wish it would, that would be amazing!). It’s easiest to propagate aloe vera plants by division, but they can be propagated from stem cuttings as well (which can be much more difficult). To propagate by division, all you need to do is remove the aloe vera offsets from the mother plant. Aloe vera will grow offsets (aloe vera pups) around the base of the plant, and these babies can be removed from the mother plant and potted up on their own to create a new plant. It’s as easy as that! 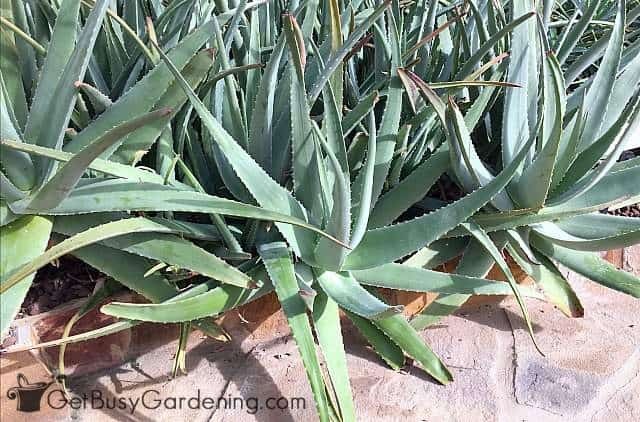 Get my step-by-step instructions for how to propagate aloe vera by division. If your aloe vera plant has grown huge and has a long stem at the bottom (and you’re feeling brave), you could try propagating the whole thing from one large stem cutting (this is how I ended up with two humongous aloe vera plants!). It’s much easier to do if your plant has already started growing roots on the stem. After you make the cut, allow the wound to cure (dry out) for several days so it calluses over (the larger the cutting, the longer you should let it cure). Then dip the cutting into rooting hormone and stick it in a dry sand/perlite soil mix, or use a gritty succulent potting soil. Keep the air around the cutting humid, and do not water the soil until you see new growth. You can also leave the stem piece growing in the pot after you cut off the main plant. That will start to get new leaves again, and grow into a whole new plant. Healthy aloe vera plants rarely have issues with insect pests, but sometimes mealybugs or houseplant scale can attack a plant. If you notice some yucky bugs have invaded your aloe vera, make sure you treat them using organic pest control methods. Toxic chemical pesticides don’t always work on houseplant pests, not to mention the fact that they’re really bad for our health too! For small pest infestations, simply dipping a cotton swab in rubbing alcohol and using it to remove the bugs is usually all you need to do to get rid of them. Organic neem oil, insecticidal soap or a horticultural oil spray work very well to control larger outbreaks of houseplant pests. But aloes can be sensitive to certain sprays. So, be sure to test anything you use on a small part of a leaf before spraying the whole plant. 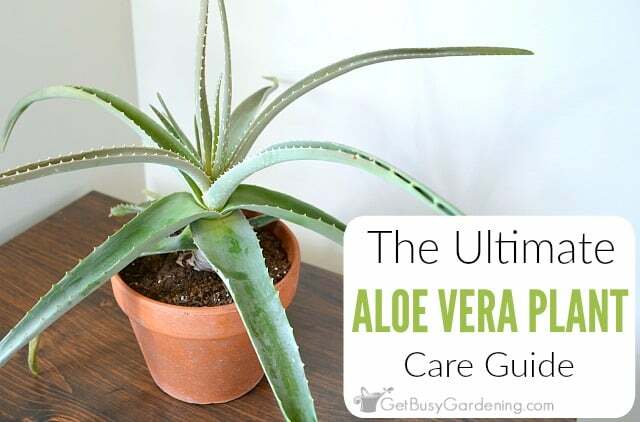 The main problems that most people have with aloe vera plant care are due to overwatering or insufficient lighting, so make sure you’re familiar with all the care tips above to avoid any issues. 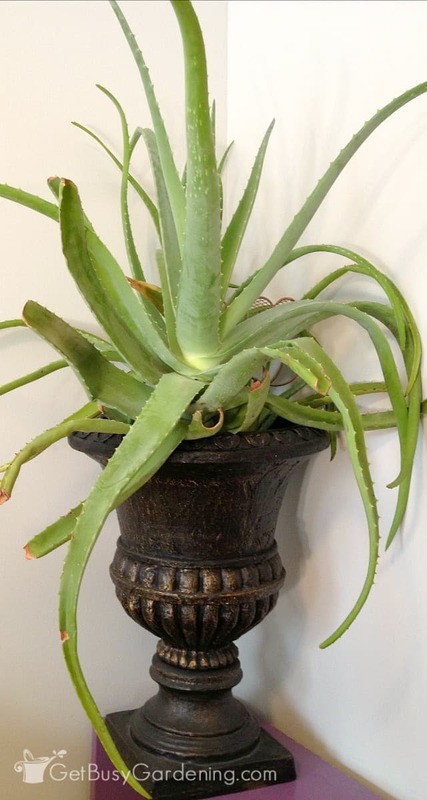 Here are some other common aloe vera plant care problems, and what to do about them. 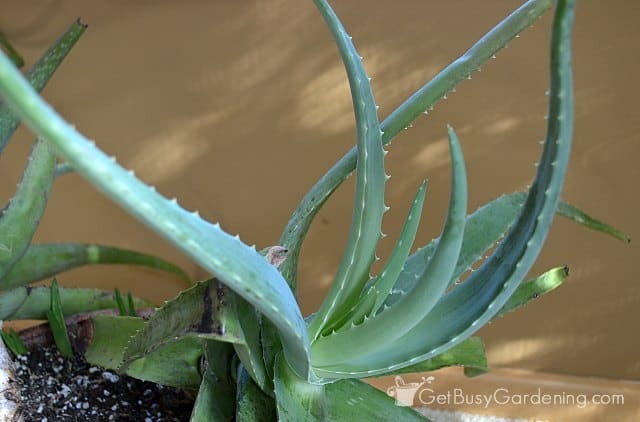 Mushy stem – If the stem of your aloe plant is completely mushy it means that the plant has been overwatered, and now it’s rotting at the base. 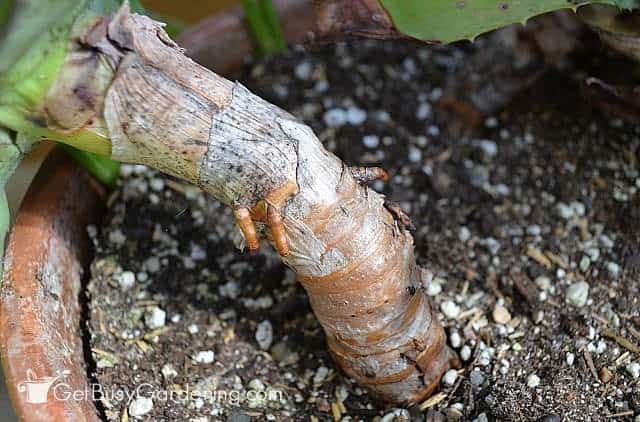 If the rot has just started, and most of the stem is still firm and healthy, then you might be able to save your plant! But you have to act fast. Cut the stem just above the rotted section, and try propagating it (see the propagation section above). Make sure you cut off all of the rot before propagating or it will just continue to spread up the cutting. Brown leaves – The first thing to do is check the stem of the plant to make sure it’s firm and healthy. If the stem looks good, then check the brown leaves to see if they are mushy, or if they are dried and shriveled. If your aloe has brown mushy (rotting) leaves, but the stem is still firm, simply trim off the mushy leaves at the point where they’re attached to the stem, and slow down on watering. 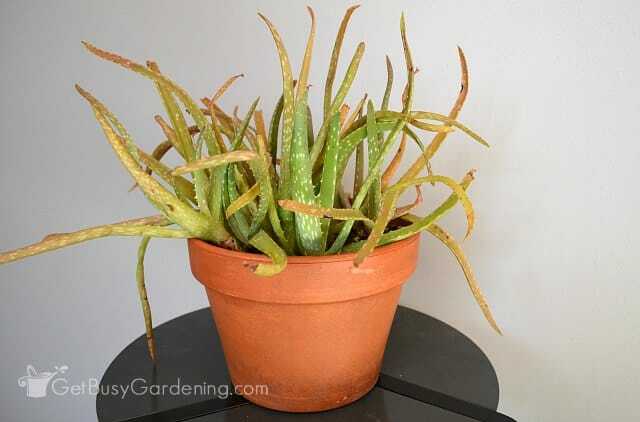 On the other hand, if the leaves on your aloe are drying out and shriveling up, that’s a sign it’s getting too dry (yes, it is possible to under-water an aloe vera plant!) and could use more water. Dry leaves can also be trimmed from the plant. 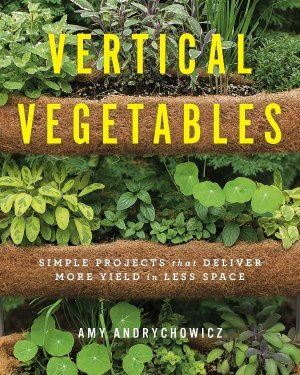 The plant is very tall and thin – This means your plant hasn’t been getting enough light. Move it to a sunny window, or add a grow light to give it more light (see the section above about sunlight requirements for more details). If you don’t already have an aloe vera plant, I highly recommend getting one. If you’re wondering where to buy aloe vera, check your local garden center, or you order one online. Aloe vera plants are easy to grow plants that thrive on neglect. 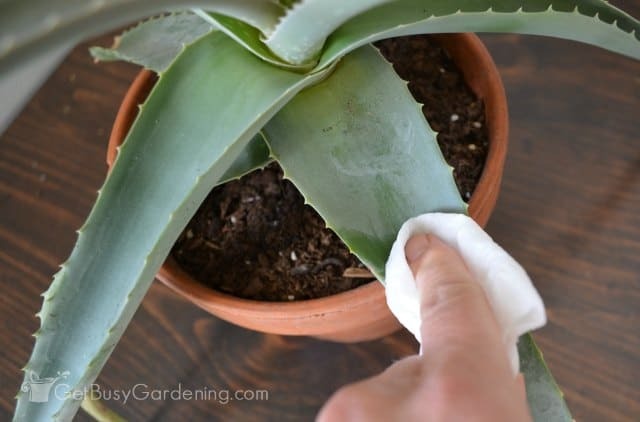 Once you get the hang of these simple aloe vera plant care techniques, your plant will grow for years to come. Gritty Succulent Soil Mix Makes Growing Succulents A Snap! Do you grow aloe vera? Share your aloe vera plant care tips in the comments section below. I grow my plants outside. Because the summer sun can be so intense in the Houston area, mine seem to do better in morning sun with afternoon shade. I have almost 30 aloe plants in my house love them! 5 of them are b/w 12-15 inches high. They get good amounts of sun, but still growing tall. The leaves are thick and strong. One of my largest ones grew a tall stem and bloomed yellow flowers! I didn’t know they did this. I forgot about one of my sloe plants. I left it on a window sill in another room and the curtains were shut. I must have left it 3+ months. I thought, for sure, it was dead. Nope! Healthy and has pups! Also, it too is growing a stem and has flower buds on it! Cool! Yes, all types of aloes bloom. Some bloom more often than others. I have a few that bloom several times a year, and others (like my aloe vera) that have never bloomed. Can you tell me types of aloe vera? And which one is usefull in cosmetics? Aloe vera is the type. 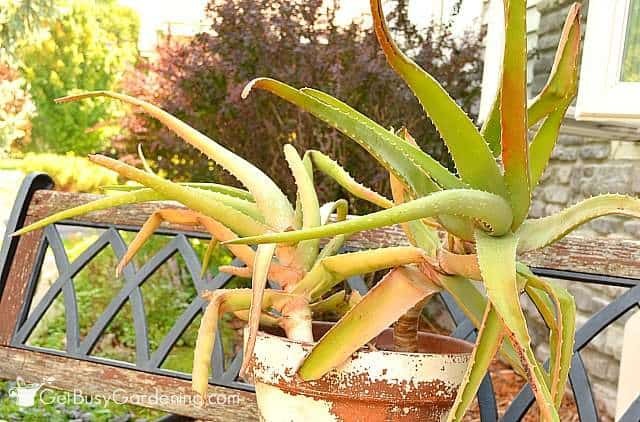 This article is soooo informative, I now know that I can really take care of my Aloe AND help it to thrive. Thank you! I just wanna to ask some question. 1. 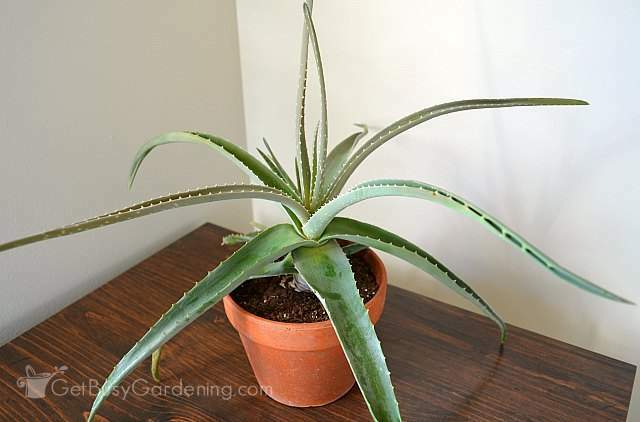 Can i planted Aloe Vera indoor ? 2. 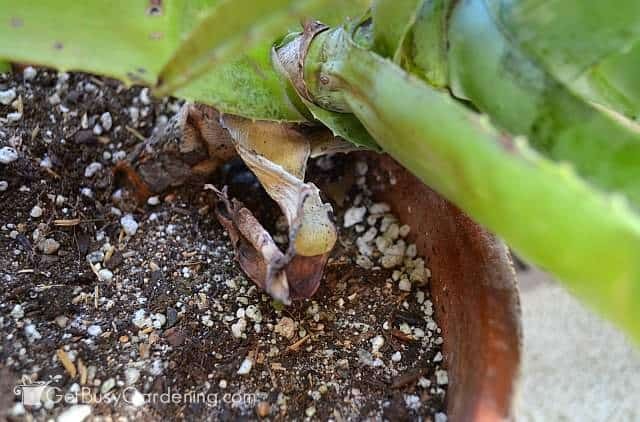 Can i use sand instead of soil to planted Aloe Vera ? Yes you can grow aloe vera indoors. I mix sand into my DIY succulent soil mix. 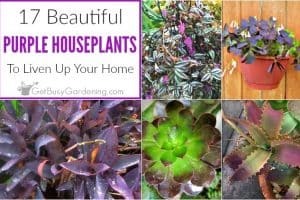 Here are a few links about succulent potting soil that will help..
I’m so glad I found your article… I live in the Northwest (Tacoma, WA) area and I want to try growing Aloe Vera and a couple other Aloes indoors from seeds… I’m gathering what I need now I.e. – pots, soil, drainage trays for the window sills and full spectrum LED plant lights… Can you please add a section on growing Aloe Vera from seed, I can’t seem to find much info on that. 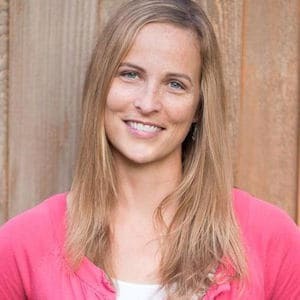 Hi Tess, I will add it to my list. 🙂 Did you buy aloe vera seeds somewhere, or are you collecting the seeds yourself? Like the parent plant, just be sure to use a sandy soil and don’t overwater the seedlings. Great article and wonderful photos! Maybe I missed it but, I didn’t see anything about pot size. Do they like to be root bound or have a little room? Thank you. Great question! My aloe vera loves to be pot bound. The roots don’t get very deep, so I would recommend planting them in a small pot where they have some room to grow, but not too much. Mine has been growing in the same pot for several years. I just slide it out of the pot every few years to remove some of the aloe pups, then plant it back into the same pot, filling in any spaces with fresh soil. hello there! my grandparents have an aloe plant that’s over 20 years old and has never been propagated. it has always been an indoor plant. it is turning into a giant monster, about 5 feet wide with a thick spiraling tree-like stem that has moved from the pot to about 2 feet over on the stand it is on. i need to fix it, but i haven’t found anyone whose aloe plant is this much out of control! it’s like a monster plant. please help! Oh my, that sounds amazing! My aloe vera did the same thing several years ago. I cut the whole top off and propagated it. Yes, I was brave. 🙂 Allow the stem to dry for a few days until the cutting is calloused over. Then dust it with rooting hormone and stick it in a pot filled with a dry sandy soil mix. Don’t water the soil (I can’t stress this enough), but you can mist the cutting once and a while (or put it in a humid location). Leave it alone until you see signs of new growth, which means it’s rooted. It took several months for my huge aloe cutting to show signs of new growth. I left the main stem in the original pot, and it regrew. Now I have two huge aloe vera plants! Good luck, and have fun! i have one that is doing the same thing. i topped several of the four foot tall growth back to two feet and planted the other pieces. they “took” well and are doing fine. the problem is getting rid of them. trying to use them as gifts to people who have room to grow. one can only grow so many you know. How do you keep the Aloe Vera leaves clean from dust? Are there different types of aloe vera plants? I have 2 that I bought that were labeled aloe Vera. One is like what you showed, but the second one is tall with long stems and smooth edges. Aloe vera is just one species of aloe plant. There are tons of different varieties of aloe plants, but only one that is called “Aloe vera”. Unfortunately, it is very common for other species of aloe plants to be labeled “Aloe vera”, even though they are a different species of aloe. What am I doing wrong to my aloe plants? I’ve had 4 that have died. I’m careful not to over water, planted them in proper soil and still no success. I just got a couple plants that looked very healthy and within a few days they look sunburned. I’ve moved them from various windows to see what kind of light they need. HELP! If your aloe plants are getting sunburn, then you definitely need to put them into a shadier spot and slowly acclimate them to a full sun location over time. As for your other aloe plants that have died… can you give me more details? What happens right before they die? Do the leaves start to turn black at the base, and droop/drop from the plant? Does the whole plant collapse and die at once? Do the leaves become shriveled and completely dried out as the plant slowly dies? The #1 killer of aloe plants is overwatering. So, I suspect that’s probably what’s happened to your plants. What would be the reason for leaves to turn purple? Aloes can turn different colors in different environments. Red, orange, purple and gray are all pretty common colors that aloe veras can change to. Sudden changes in lighting, watering, feeding, temperature… pretty much any environmental change can trigger the color change. As long as your plant is firm and not mushy, and otherwise looks healthy, then it should be fine. Just be sure that it’s not being overwatered, and that it wasn’t suddenly moved to the full sun and getting sunburn. There are lots of different varieties of aloe plants that come in different colors too, so it may also be that yours isn’t an aloe vera, but some other aloe species. How do I use Epson Salt in a Aloe Plant? I do not recommend using epsom salt in an aloe vera plant. The cut leaves will not regrow. New growth will come out from the top of the plant. I bought my aloe plant about a year ago. The previous owner had a cat that left bite marks. I thought they’d heal. Should I trim those off? The wounds on your aloe leaves should seal up and heal, and the plants should recover just fine. If the wounds are showing signs of rot, or the leaves are heavily damaged, then I would trim them off. Otherwise, if the damage is minor, they should be fine. Thank you. I tried them. The brown hole scars were unpleasant to look at. But I did wrap them and put them in the fridge. The have a lot of gel in them. I have had my plant out side all summer and want to bring it in. I have noticed some flowering plants or other plants I have brought in over the years bring nats. Is there a spray or something I can use on it to make sure I don’t bring these with me I would hate to loose my aloe! I live in Central Texas, and I have several beautiful aloe plants doing very well on my front porch. We live in a duplex, which basically means we have terrible natural light, so I’m hesitant to bring any of them inside (although I’d love to have a few indoors). My question is when it comes to the winter, do I HAVE to bring them indoors? Obviously, we don’t have very intense winters, but it still gets cold, so I wasn’t sure if they’d do alright outside. I also have wandering Jews and a couple of agave (obviously not the same, but nervous about all of them when winter gets here). Any advice would be great! My aloe has a long stem, when I re-pot do I need to pot deeper to cover some of the stem. My plant is tall and started to tilt at one point. You sure could do that. If the stem on your aloe vera is super long, you could also think about propagating it at some point (if you’re brave enough to try 🙂 ). Dried up leaves is common for an aloe plant that’s not getting enough humidity/moisture. You can try watering your aloe a bit more often, or move it to a place that’s a little more humid. Don’t go overboard though, they don’t like a lot of humidity, or to be overwatered. Sometimes it can be a tricky balance. Hi Amy, I just bought an aloe plant that I plan to keep indoors. I live in an apartment with not a lot of light and I live in the midwest. Not a lot of light and we are moving into winter, so my question is do you suggest a grow light? If your aloe vera plant is small, then this grow light would be perfect. I recommend leaving the light on for 12-14 hours a day, ideally. But it will tolerate less light than that during the winter. Don’t feed your aloe, and cut way back on watering it though the winter. And if you are going to move your plants during the winter, you definitely need to take care that they do not freeze. Even a few minutes in the frigid Midwest winter air could cause major damage, or even death to houseplants. Move them in and out as quickly as you can. Warm up the car before brining your aloe vera outside (or any other houseplant), and make sure you cover your plant completely with a blanket or towel during transport. Then when you get to your new home, bring the plants in first so they’re never sitting in the car. Great advice! Thanks a bunch. Hi! I just moved into a new home and put my aloe facing a window but not directly in front of it, and I watered it as usual, once every few weeks, but now it has become droopy and the leaves are soft and mushy. I’m worried I overwatered it and it’s rotting but I also don’t know if it just wasn’t getting enough sun, so I moved it directly in front of a window to be safe. What do you think the problem is? Don’t give up just yet. I overwatered my aloe plant last summer just after moving it outside (I live in the Midwest). It got all mushy and brown. I thought it was a goner. My husband suggested we just ignore it and let it dry out. It worked! My aloe came back and grew like crazy by the end of summer! Now my pot is overrun with the main plant and a ton of offshoots…So many I don’t know what to do with them all. Don’t give up on your aloe just yet. Woohoo! I love that story! Thanks for sharing. Does the Aloe have any companion plants that I can put in the same pot? Really good article and so informative! I have an aloe vera plant which was doing really well but seems to be a bit sad now and wondered where I’m going wrong? Some of the leaves are drooping slightly and as a result are lacking gel in places. Also, any ‘babies’ that are produced don’t seem to do very well from the get go and don’t really develop – I’ve re-potted one which has remained the same size for a while now and the leaves don’t feel developed at all really. I’ve also got another sprouting between the larger ones and that’s the same already. It sounds like I’ve re-potted the larger plant in to a pot too big for it as well, as you mentioned that they don’t require too much room, so I think I’ll need to down size! Any tips on how to make my plant thrive as I’m kind of known to send them to their deaths (not on purpose of course!) I live in a small flat in England and have no garden so have indoor plants. My front room gets all the sun, which is where my aloe plant is, obviously though sun is limited for me! I’m still very hopeful and my plant doesn’t show signs of rot or anything like that so think it can be saved! You said that the leaves should be full but mine are starting to grow long and thin…Any help would be much appreciated! On the plus side – my spider plant is growing like crazy and I’ve been able to pot 2 babies up to now! I also have a peace lily in the bathroom as I hear they like steam…I’ll have a mooch through your page now to grab some tips on that one as well 🙂 Thanks in advance and sorry for the complete novice language in the world of plants…I’m determined to become green fingered for when I get a house! Hi Lucy, Thanks, glad you liked the article! I wonder how often you’re watering your aloe vera plant. If the leaves aren thin then you might not be giving it enough water. It’s good to keep it on the dry side through the winter, but they can be watered more often during the summer months. I don’t water my large aloe plant at all during the winter, but the smaller ones get watered about once every month or two (once the soil has dried out between waterings). You could also try putting your aloe outside during the summer, they love that. I put mine out every summer and it grows huge and thick leaves. Just be sure they’re in a pot that has draining holes and fast draining soil if you put them outside. Can you give guidance with roughly how much cc to water small alor,just right where the stem is or everywhere, the plants are indoor now in winter in the UK, thanks. I’d love to help, but I don’t understand your question. Could you rephrase it? Apology for the blunt wording. Each time when i have to water the alor, about how much of water by milliliter per pot? and where should i pour the water? Around where the stem is or everywhere on the pot? Simply pour water over the top of the soil until the soil is covered, or until water starts to run out the bottom of the pot. But, be sure that the soil is completely dry before watering your aloe vera plant. If plant was frozen from being outside…can it be saved? Aloe vera is hardy down to about 20F. 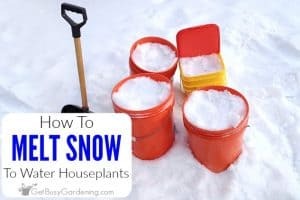 So, depending on how cold it got, you may still be able to save the plant. Aloe veras can’t be propagated from leaf cuttings, but you can take stem cuttings. Read more about how to propagate them from stem cuttings in the section “Propagating Aloe Vera Plants” above. You’ll find everything you need to know about growing an aloe vera plant if you read this guide. 🙂 Let me know if you have any specific questions. I’ve been growing my aloe vera in a large pot and it is a decent 45 cm plant. it got pops and everything. do I stick with what I am doing or they what you are doing. First of all, love all your advice and thank you!!! My question is….should I not put an aloe in water beads as they release H2O as needed? Thank you can’t wait to hear your comment. Humm… sorry but I don’t understand the question, could you rephrase? The water beads are still wet. I’m not sure if that would cause the roots to rot? You’re welcome! I hope your aloe will grow a thrive for years to come. Hi, Amy! So I’ve been growing my aloe since last summer, they were gifted to me and fairly mature. I grew them on my pretty sunny front porch and they THRIVED, even flowered, and grew pups like crazy. During the winter, I brought them inside my house and have only recently put them back outside, in exactly the same spot they were before. Unfortunately, ever since I put them back outside, they’ve been turning red/brown and getting black spots. I also removed all the pups and repotted them, but I used a couple of bags of soil I had on hand from last fall and watered them as soon as they were in their pots. They look awful! I’ve gotten a lot of mixed opinions on when I should’ve watered them and I’m so confused. Do you think there’s any hope? Should I buy fresh soil and try again? I’m even considering buying some succulent liquid fertilizer to see if that helps. Currently moved them to the side of my house where it’s a bit shadier, but any advice would be appreciated! Poured so much love into them the last year, don’t want to lose them. Sorry to hear your aloe plant is struggling! If you moved it directly from the house onto the sunny porch, then that could be the problem. Just like humans, plants that aren’t used to being in the full sun can get sunburn. So, leave your aloe in the shadier spot you mentioned, and give it some time to get used to being outside again before moving it. Then slowly introduce it back to it’s full sun location over the period of a few weeks (gradually giving it more sun every few days). If you start to see signs of sunburn again, move it back to shade and give it more time. As for the soil, just make sure you’re not overwatering it and that the soil is drying out between waterings. I definitely wouldn’t fertilize it until it recovers. Sorry but I really don’t know anything about eating aloe vera. I have seen it as an ingredient in several juice and food products, but I have no idea how to properly prepare it. I definitely would not eat the leaves straight from the plant. I would think they would taste terrible anyway. Thank you for the information! I do have a question. I received a plant that’s already grown but in the process of him dropping it off and me picking it up there was a random patch of cold weather (25-35 F). The plant looks very droopy and folded, do you think it is able to perk back up or is it done for? Oh no, sorry to hear your aloe was exposed to the cold like that! Check the leaves and see if they are mushy. You can prune off any damaged/mushy leaves and leave the healthy, firm ones. 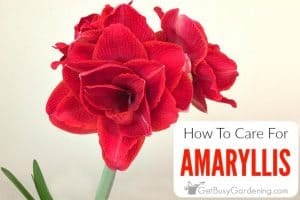 But even if the entire plant is mushy and seems to be a goner, don’t toss it out. It may grow back from the base with time. I offered some friends pups off my huge outdoor aloe plants. Someone stated i had better make sure its the ‘right’ kind if plant before someone rubd it on their body. Is there a ‘wrong’ type of aloe plant and how does it differ? Yes, your friend is right. There are tons of different varieties of aloe plants, and aloe vera is just one of them – and the only one with medicinal gel. Hi! I bought an aloe vera plant around 3 months ago, and have harvested 2 leaves since. I’ve been careful not to overwater it and keep it in a sunny area with enough shade, but so far there hasn’t been much growth from the buds growing at the top of the plant. I was wondering if I should re-pot it or move it indoors. What should I do? Aloe veras aren’t super fast growing plants, so I don’t think you need to be worried. It sounds like you’re doing everything right. They can take full sun, as long as you introduce them to it slowly so they don’t burn. So, you could try moving it to a sunnier location. Hi Amy, Great article however I’m still not sure what I’m doing wrong with my aloe. I have had it foe a few years, it’s in a small pot on my kitchen windowsill. It has turned all yellow however it is not mushy and some leaves have also dried up. At one point I felt I was watering to much so I stopped, then I thoght maybe I was watering it to little so I watered it more (still not a lot of water just more frequently). Nothing seems to help. What are your feelings? When the leaves dry up and turn brown and crispy, it means your aloe isn’t getting enough water. You can start watering it a bit more often, but still be sure to allow the soil to dry out between waterings. I haven’t had that problem much with my aloe vera. It can happen if the plant is moved a lot, or if you have it in a high traffic location where people are bumping into it or brushing up against it a lot. If the creasing leaves has become a big problem with your plant, I would see if you could move to a new spot where it won’t get bumped or touched. Otherwise, yes, once aloe leaves crease like that, there’s not really anything you can do to fix them. I’m so glad I found this site!! I’ve been surfing the web this morning trying to find an answer to my aloe issue and really haven’t found one, so I’ll try here. My aloe vera is in a kitchen window, so gets plenty of light. It’s leaves are thick and juicy, and new leaves are growing, but the leaves won’t stand up. Wish I could attach a picture so you could see what I mean. I think it’s healthy, but I have to put supports in and attach the leaves so it doesn’t take up so much room on my counter. It’s just that I’ve seen a lot of aloe vera plants and none look like mine does. Any thoughts on this???? It sounds like you may have a different type of aloe plant, and not an aloe vera. There are tons of different types of aloe plants, and many times they are mislabeled at the store. But, if you’re sure you have an aloe vera, and the leaves are flopping as you describe, then I would check the trunk and make sure it’s not mushy or rotting. Your aloe veras will be just fine for three weeks without water. so yes, just water them before you go, and they’ll be happy. As for repotting, yes, you can use the same soil to repot a plant, and fill in the gaps with fresh soil. There’s no reason to add stones into the pot. Some sites recommend using stones in the bottom for drainage if the pot doesn’t have drainage holes, but this is a myth. Always, always use a pot with drainage holes for aloes, and be sure to use fast draining soil for succulents. Stones in the bottom won’t do a thing to prevent overwatering. My aloe vera is mushy to touch because of too much rain in just a week. Can I still revive it? Thank you. Oh no, sorry to hear that your aloe vera is mushy! There’s not much you can do, time will tell if it will recover or not. I would definitely let it dry out completely, so move it to a protected location where it won’t get anymore rain right away. After a few weeks, you will know for sure if the plant is going to survive or not. 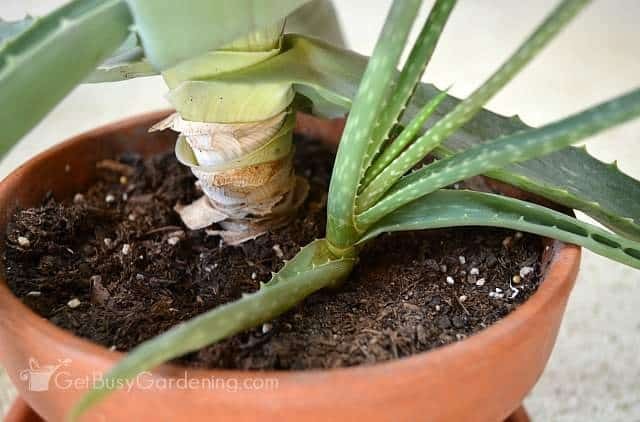 If it’s a lost cause, you can try cutting back the rotted aloe vera, and it might still grow new babies around the base. I just bought an aloe vera plant from a supermarket. I cut a few of the leaves from the base for the gel. Some leaves I couldn’t cut close enough to stem is that okay? These leaves will not grow back right? What’s the proper way of cutting the leaves? Yes, the leaves you cut from your aloe vera will not grow back. They will probably just dry up eventually. It sounds like you harvested them correctly, and the way you did it won’t harm the plant. Can you tell me please is it natural for a white bulb like pant to grow in between leaves of my aloevero plant. Did a piece of another plant somehow get dropped into the pot with your aloe vera? Or do you mean it’s growing from the actual leaves? Could it be flowering? I have one growing indoors in a south window in Vancouver BC. Haven’t done anything special with it. No pesticides etc. Mostly just gently squeezed the leaves (about 3ft long, 4 inches wide near the stock and 1.5 inches thick) to tell me when it needs water. If they become a little soft then it gets water. When the leaves are firm it gets nothing. It has had many babies which were extracted usually in the spring when I’d repot it. It has flowered about 5-6 times over the past 15 years. I treat the jade plant similarly, squeeze the leaves etc. It has flowered about every third year on average. As per your information, sun light and minimal water. They like to be treated with minimal attention. They seem to like compost tea, and vermiculture (worms) tea. Awesome, sounds like you’ve go the knack for growing aloe vera! Thanks for sharing your aloe vera care tips with us! Can I just use regular tea leaves and not the bags? I didn’t know you can do this on an Aloe Vera. Is it true you can use carrot skins? Read that on some other website. Are you asking about the compost tea? If so, that’s not made with leaves like the tea we drink, it’s made from compost. So yes, you would need to buy the tea bags with the compost in them for that. I’m not sure what your question is regarding the carrot skins though, sorry. I noticed in the last pic of your aloe veras where you are wiping off the dust. It looks very sad and starved. The leaves are lacking in water I noticed this problem with my own aloe vera after recently reviving it. You need to water it more consisetntly or figure something else out it doesnt look healthy at all. The leaves look very droopy and not from being full and heavy. Your care tips are excellent though they’ve helped quite a bit.